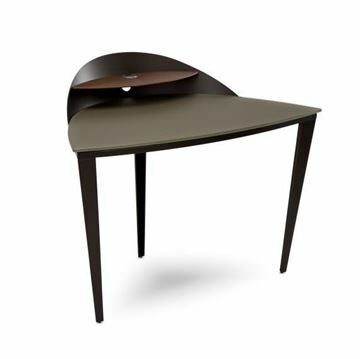 The Alcove desk by Elite Modern is like a small cozy cocoon, with a wraparound shroud and lots of curves. Although designed to fit into an unused corner, the Alcove can be placed on any wall or floated in a room. The glass desktop is finished in etched glass, encompassed with the sleek steel shroud. A petite walnut utility shelf adds convenience and organization. There is a built in power/USB port to keep devices energized. Custom choices are available from any Elite powder-coat and wood finish to make sure that Alcove exactly matches your décor. 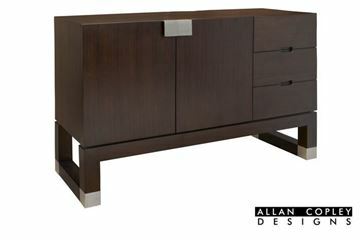 The Haven Small Desk by Elite Modern. We’ve taken all the fashion and functionality of our popular Haven desk and resized it to fit in a variety of more compact spaces. All power access and wire management needs are addressed with included pre-wired power strip with surge protector, phone line, and cable hookup. Just open the magnetically-latched fold-down access panel, make your connections, and simply close the panel— no tools needed! You can run all your cables through the access grommet on the desktop, which features a dynamic inset Sable/Caviar glass accent. The dynamic arched body, clad in stainless steel panels and rich walnut veneer, artfully conceals all wiring and connectors. The Haven laptop desk is available with either Sable or Caviar etched insert in the tempered glass top, and the walnut veneer body is available in a variety of finishes. 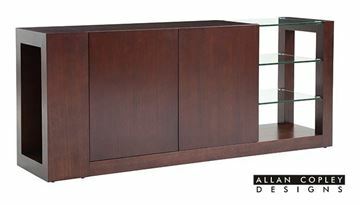 Haven credenza, file cart, bookcase, and buffet also available. The Haven File Cart is a perfect stand alone piece to use in any office, as a side table, or even as a nightstand. 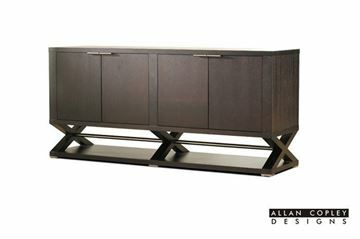 It's the perfect compliment for the matching Haven Desk by Elite Modern. 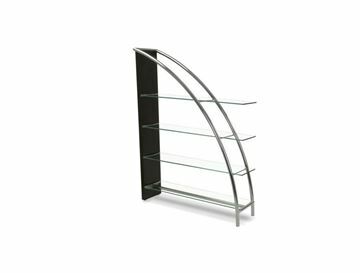 Available in any Elite powder-coat finish, with either Sable or Caviar etched tempered glass. Walnut veneer components are available in a variety of finishes. The Haven Desk by Elite Modern. Fashion meets functionality in this striking system, ideal for your home office or your corner office. Power access and wire management needs are addressed with an included pre-wired power strip with surge protector, phone line, and cable hookup. Simply open the magnetically-latched fold-down access panel, make your connections, and close the panel when finished. No tools needed. You can run all your cables through the access grommet on the desktop, which features a dynamic inset accent, which is available in either a Sable or Caviar acid-etched glass. The dynamic arched body, clad in stainless steel panels and rich walnut veneer, artfully conceals all wiring and connectors. 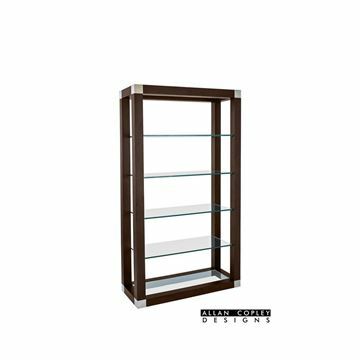 Available in any Elite powder-coat finish, with either Sable or Caviar etched tempered glass. Walnut veneer components are available in a variety of finishes. The Victor Desk, part of the Home Office Collection by Elite Modern. The entire collection is customizable, and exceptionally well made. Please see below for all available finishes. Desk measures 36"d x 72"w x 29.5"h. File cart is on casters, and measures 20"d x 19"w x 27"h. Credenza measures 20.5"d x 72"w x 29.5"h. Bookshelf measures 16"d x 48"w x 72.5"h.